Rachael said this meal was perfect for linner (lunch/dinner), saying "why let complicated dishes and mealtime conventions get in the way?" 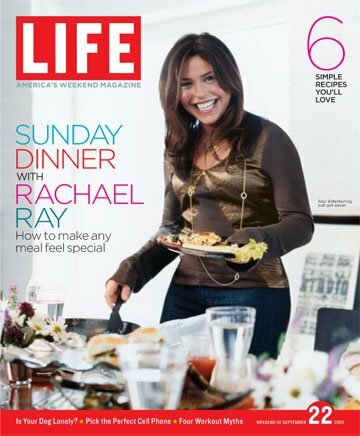 Rachael also gives some tips on how to throw a fun and casual party: "When my husband and I entertain at home, we always entertain with casual food. You get better stories and more laughter that way." You can keep it simple. Don’t prepare dishes you’ve never cooked before. Instead, choose a favorite that’s fun to make—it’ll probably delight your guests, too. “I’d rather eat chili than a fussy meal any night,” says Ray. “Eight people is the max. It’s a number that’s easy to control,” she notes. "Don’t try to be all things to all people. Instead of having a gang over, host smaller groups. " "You can cook and socialize at the same time. When the menu is easy, the preparation is less stressful. You won’t be chained to the stove or sink, and you’ll actually have more time to catch up with your pals. Isn't that the whole point of having them over anyway?" I made Rachael's Carbonara pizza and it was delish! I used whole wheat Boboli, which I prefer. I still haven't found a good whole wheat pasta. Which is weird b/c I usually like the taste of whole wheat bread better. I have not tried that pizza but it certainly sounds like a keeper. I use the O Organics brand whole wheat pasta from Safeway and like it. I used to use Dreamfields, which is a whole wheat pasta blend, but I made the switch to 100 percent whole wheat.